Online witnessing is now available using Legalesign eWitness software. Developed in accordance with Law Society guidance, the witness must be physically present to attest the signature. To date witnessed contracts have only been possible using traditional pen and ink, but contract signing can now go fully digital by using eWitnessing from Legalesign. Electronic Signature for contracts provides 3rd party audit proof of all events in connection with a document and tamper-proof Certified PDF to guarantee future integrity. Legalesign is ISO27001 certified for electronic signature and document storage. The productivity gains for business are considerable. Signers can sign on the move without having to print, scan and sign, improving customer experience. Business gets done quicker, more easily, and paper-free. Contact us for our service description or more information about our compliance and security. 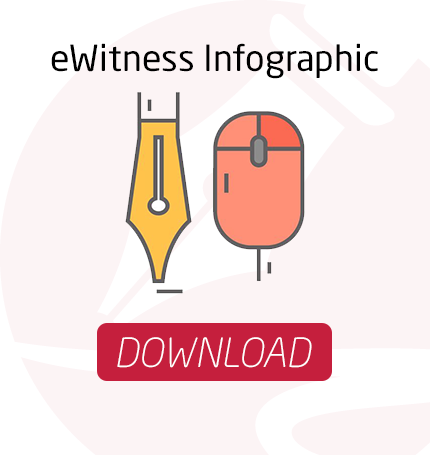 Download the infographic for more details on the witness signing process. See what some of customers have said below. Of all the options we looked at Legalesign offered the best, straight-forward solution for us at the best price. We have found Legalesign easy to use and their follow up support has been excellent...We had previously spent a lot of time scanning, emailing and posting documents to our clients and subsequently spent even more valuable time tracking who had signed what, in what format and chasing up missing information. With Legalesign everything is readily available to view in one place, even with multiple colleagues sending out different documents. It's easy to see exactly what stage each document is at. Simple effective and efficient process has enhanced the security of our operations. Controls our authoritative Hierarchy and provides comprehensive tractability.Simple to install, use and manage, highly recommended. I found Legalesign in 2014 when I was looking for a lightweight digital signature solution for my buy-to-let properties. I manage my properties myself without an agency and having ditched my printer I wanted an easy-to-use online system. The online app is solid, fast and easy-to-use; I was able to send an agreement with a deed supplement that required witnesses and got it signed by 6 separate people in sequence - it was magic!